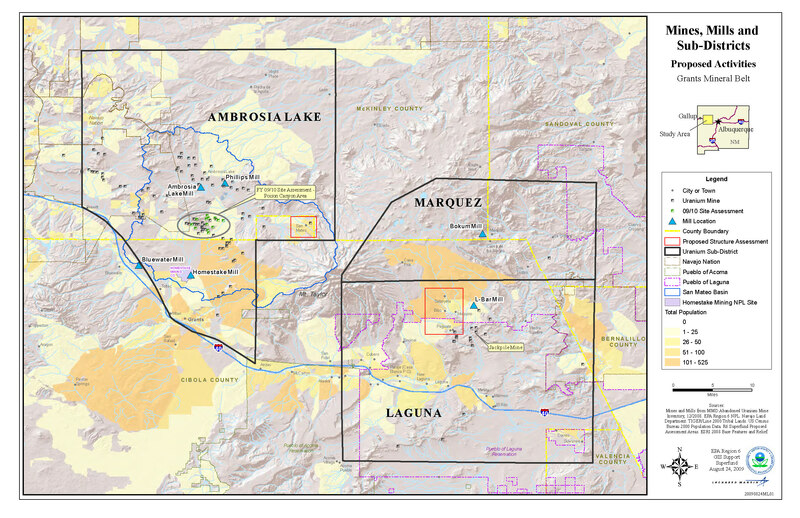 The legacy uranium mines and mill sites in the Grants Mining District may have contributed to degradation of ground water quality within the San Mateo Creek Basin. Read more about San Mateo Creek Basin. Uranium milling operations at the Homestake Mining Company site began in 1958. The mill was decommissioned and demolished from 1993 to 1995. Read more about Homestake Mining Company. Mining operations were conducted from 1953 through early 1982 from three open pits: Jackpile, North Paguate, and South Paguate. Read more about Jackpile-Paguate Mine (PDF) (3 pp, 250 K, About PDF). The Grants Mining District was the primary focus of uranium extraction and production activities in New Mexico from the 1950s until the late 1990s. The belt extends along the southern margin of the San Juan Basin in Cibola, McKinley, Sandoval, and Bernalillo Counties as well as on tribal lands. Several mines in this area are under the jurisdiction of New Mexico Environment Department, New Mexico Energy, Minerals, and Natural Resources Department, and EPA. EPA is working with state, local, and federal partners to assess and address health risks and environmental effects of the mines. For more information, read The Legacy of Abandoned Uranium Mines in the Grants Mining District, New Mexico. Community outreach is being planned for the Grants Mining District region for Spring 2019. Check back here for specific dates and meeting locations as they are confirmed. The GMD Phase 2 Groundwater Study is now available at the link below.